1. Having a moldy or musty smell: funky cheese; funky cellars. 2. Having a strong, offensive, unwashed odor. 3. Of or relating to music that has an earthy quality reminiscent of the blues. 4. Combining elements of jazz, blues, and soul and characterized by syncopated rhythm and a heavy, repetitive bass line. 5. Characterized by originality and modishness; unconventional: "a bizarre, funky [hotel ] dressed up as a ship, with mock portholes and mirrored ceilings over the beds" (Ann Louise Bardach). 6. Outlandishly vulgar or eccentric in a humorous or tongue-in-cheek manner; campy: "funky caricatures of sexpot glamour" (Pauline Kael). the throne of the third heaven of the nations millennium general assembly on display at the smithsonian american art museum. made in the 1950s and '60s by visionary artist james hampton, a night janitor for the federal government. mr. hampton devoted almost 15 years to creating this chancel out of gold and silver aluminum foil, cardboard, light bulbs, old furniture, insulation scraps, mirror fragments and other items he found at work, on the street or in secondhand shops. if you are visiting d.c. make sure you pop into this museum this piece will blow you away! each june the cleveland museum of art sponsors a city wide celebration of creativity and fun called parade the circle. talk about funky - central!! ! what can be more fun(ky) than seeing a rhino walking down the street! part of a campaign to save the rhino. london, march 2003. by the way, with the exception of the platypus, the rhino is the funkiest animal in the book of mouse! street performer in paris, 2004.
funky hat, washington dc, june 2009.
how can I put up a post about funk and not mention chickens! outbuildin on the grounds of the dunham tavern. okay, I just thought these were some really funky mushrooms. which just goes to show even mother nature knows how to do funk! today's song is dedicated to the loving memory of tanner and jake who were both total atomic dogs while they were on this mortal coil! tanner and jake were the canine companions of my friends ken & gig, and reya. the dogs crossed the rainbow bridge this past week. ken, gig, and reya my heart goes out to you and tanner and jake - I hope you guys meet each other on 'the other side' and share a bow-wow-wow-yippee-yo-yippee-yeah! George Clinton might be mad as a hatter, but he certainly does bring da funk! Why must I always chase the cat?! Great to see the young rappers on the stage with George. Oh you, every damn week you nail this! Love the Rhinosaurusy thingy with the bare legs and the black dude with what I might add is a very sensible hat! Funky indeed. The pics just so totally capture funk. I saw George Clinton in concert once. He funked so hard they had to carry him offstage! I'm serious. Heh, heh! Looks like you covered every definition of "funky" in the book. Great shots! I liked the George Clinton video, too. I have some P-Funk coming up on my own Theme Thursday post. kimy, spot on! And I do favour the Rabbi Hillel quote; no wonder he lived so long! And no laughing but I've got one of those hats( re: cycle performer )! Great stuff. In my book, Hillel settled the whole religious question once and for all with: "If it is hateful to you, don't do it to others." End of story and onto Da Funky Chicken! well played. almost went with George Clinton...he sure knows how to bring it. need to get me one of those rhino suits...for what, i do not know, but still...lovely shots. 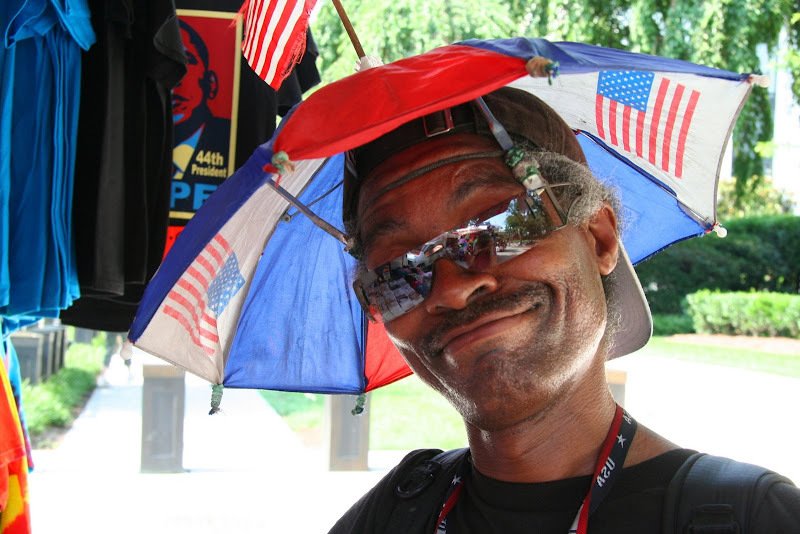 the smiel on mr umbrella head...priceless. Terrific post. Loved the pictures - every one. Really colorful and interesting photos. Atomic Dog is the funkiest song ever!! The rhino is my favorite for today! Oh and the hat and...oh well the whole post was great! love the Funky Chicken Shack, and the Rhino guy, of course. I wish I had a rhino suit, it looks like fun. I absolutely love funky hat man, too. Have a great weekend. Condolences to Ken & Gig, & Reya. Thanks so much for always adding notes on the photos. I always scroll back and look at them again after I find out where and when they were taken! Happy Independence Day, bestest Mouse! "Kernel" is a dog, made out of corn? In other words, a Corn Dog? "Why is that man wearing a diaper? :>/"
Dunno why, exactly, but George Clinton has had a diaper man on stage since Parliament Funkadelic days. Great eclectic images to relay a bunch of funk. Thank you. You could not have chosen a better song as a tribute for Jake. When I saw George Clinton live in Kansas City (when he was playing with his Parliamant band), he danced on our table. My ears rang for three days afterwards. Wow, it was a blast. Thanks for mentioning Jake. Wow. ah ha! had i participated in TT I would have used George Clinton, the master of funkadelic. Nice. Photos are fascinating. the Big Bang Exhibit weirds me out but my husband loves it; knew he would. I love the chicken coop and Alice. My husband is working on an Alice for me for Susan. I don't do photos and he loves a challenge. He likes your composition too. Those are all such great images. I've only known a little about James Hampton but would love to see more of his work and learn his whole history. He's often compared to Henry Darger, but my sense is that he was a more balanced person and his work not as disturbing. Beautiful pictures and a great blog.